There is nothing much on Anthony Watts' blog, WUWT to write about. There was some initial swooning over Murry Salby (whose name Anthony got wrong). According to Pierre Gosselin whose article Anthony Watts quoted: If anyone ever demolished the dubious CO2 AGW science, it’s Salby! If that's the best the fake skeptics can come up with then they'll be disappointed. June 10, 2013 at 9:56 am Go Murry! June 10, 2013 at 11:02 am A Man of science without a doubt. June 10, 2013 at 11:05 am Strong words of wisdom. June 10, 2013 at 11:10 am Great speaker, and impressive finale. June 10, 2013 at 11:24 am Brilliant. Further down in the thread people started finding flaws in Salby's ideas. I'm not going to waste any more space on Salby. If you are curious about Salby and his odd notions, there is this article and more on SkepticalScience.com. And there was David Middleton, recycling the myth that "they said it was cooling in the 70s". Which as far as I can gather may be another case of "the USA is the world world, nowhere else exists". 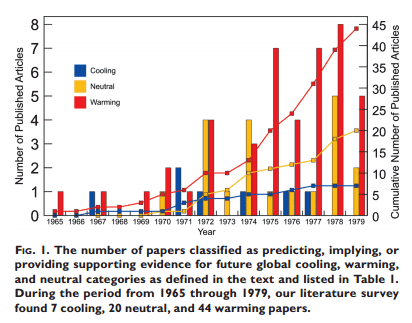 Here's the result of a 2008 study of the scientific literature, demonstrating the building up of the consensus on global warming and the fact that out of 71 scientific papers written between 1965 and 1979, there were only seven that "predicted, implied or provided supporting evidence" for global cooling compared to 44 for warming. I've been looking at old newspaper clippings from Australia and have posted a few showing real concern about the possibility of global warming in the 1940s. So much so that the first international collaboration of scientific experts was sent to Antarctica in 1949 to see if the warming trend seen in the Arctic was evident down there. Scientists agree that the droughts and freakish weather over many parts of the world might signal global changes in climate and some experts are even wondering if another ice age is on its way. The climatic situation is complicated by the largely unknown effects of man made pollution and there are contradictory theories. Heat pollution, as energy is consumed at an increasing rate, is sure to effect the weather to some extent by warming the upper atmosphere. But more dust in the atmosphere could balance this by reflecting the sun's rays back into space. Some American researchers have noted that in a five-year period the mean temperature of the atmosphere in the northern hemisphere fell by more than half a degree Celsius, but were careful to say that this was likely to be a short-term fluctuation. Some Soviet meteorologists maintain that the climate of Northern Europe, Asia and America will get "markedly warmer" by the year 2000 and link this with the known recession of the polar ice. In Australia during the 1970s there was very infrequent speculation in newspaper and magazine articles mentioning the possibility of an ice age but not much. It looks as if the spate of articles that WUWT-ers remember were probably mostly in the USA. I don't know about Europe. Of more interest are articles like this one from 1957 on global warming from CO2 emissions associated with industry. That's a couple of years before Keeling started to measure atmospheric CO2 at Mauna Loa. And this one from 1972 on fears about melting of the Arctic sea ice. "In Australia during the 1970s... "
I have a story there. In 1976, as a very junior CSIRO scientist, I took up a position in Perth. The WA gov't had a query. Wheat farming costs had changed, and it was now possible to farm marginal country where a crop could be harvested every second or third year. They were under pressure to extend their rail and support network. What were the climate prospects? I had contacts at Atmospheric Physics, so I was deputed to ask. The answer was unequivocal. The Greenhouse effect was coming, and would be bad for the wheat belt. The westerlies that bring the rain would move south as the Hadley cell expands. So CSIRO advised against, and no expansion happened. To make our point, there was a run of three very hot dry summers. But the advice is still looking good. Nick, I wonder if you got information from the same person who spoke to us at the time? It was quite possibly even the same year. Anyway in the mid to late 1970s I was studying at Melb Uni and we had a guest lecturer from CSIRO who showed us the outputs of their climate model of the day. He said exactly the same thing about the climate changing, though the focus of the lecture was south eastern Australia. Anyway, one of the things still on my to do list is to dig out the lecture notes and see if there are any differences in the detail between what was being said then and now. In the early 1970s, I was in Edmonton for the longest and (maybe coldest?) winter since the turn of the twentieth century. It got so cold at times I thought my eyes would freeze, but I figured that was normal for Edmonton. It was also very pretty with lots of dry sunny days. I was sharing a house with a bunch of students and physics post-grads. I don't recall anyone at work or in the house or anywhere I traveled at the time mentioning they thought an ice age was coming. We got in some nice cross country skiing though. Murry Salby has his own blog!! Hat tip commmentator Liam23 at the Guardian. He and Judy competing for the same audience, oh the joy and laughter (or just boredumb).